...Crypto Obfuscator does a very good job of obfuscating code, doesn’t add any further complications to my development cycle and is very affordable. Automatic exception reporting makes it extremely easy for you to catch any unhandled exceptions that occur in your software and for your users to easily report these exceptions to you with a single click of a button. The exception reports include all pertinent information including full stack trace info along with the values of all method arguments and local variables, plus the system information, the time of the exception, the build number, and optional developer defined custom data like log files, screenshots, etc. All exception reports can then be automatically download from the exception reporting service and viewed within Crypto Obfuscator. Each report and its associated data is presented clearly so you can use the information to fix the issue. 1. Create the exception reporting service and host it on your server. 2. Obfuscate your assemblies with Automatic Exception Reporting turned ON. 3. Deploy your software to your end-users. 4. If an unhandled exception occurs during the execution of your software, the corresponding exception report along with pertinent data is uploaded to the exception reporting service you created in step 1. 5. 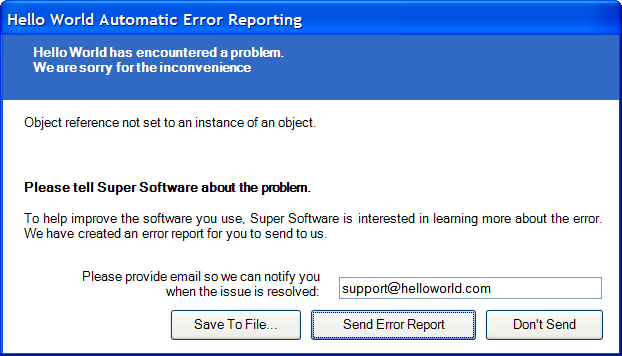 Use the Exception Reports Viewer Dialog to download exception reports from the exception reporting service and view/analyze them. Note that you can use the Automatic Exception Reporting feature on its own without using any obfuscation features. Simply turn OFF obfuscation features when obfuscating your assemblies in step #2 above. Crypto Obfuscator can optionally show a consent form to the users of your software giving them the option to report exceptions automatically to the exception reporting service. Alternatively, they can also save the report to a file for sending at a later time. Users can also, if they so desire, provide their email address so that you can get back to them when the issue is resolved. With the purchase of the Enterprise Edition, you will also get full source code for the Exception Reporting Consent Form, which you can use to localize, customize or change the look, behavior and functionality of the consent form. Add custom data like log files, screenshots, etc to the exception reports. Perform custom handling when exception is raised - for example, you can send the exception report to the reporting service or save it to file using ready-to-use API, or let the default handling take place after your own custom handling.